Each year the United States Institute for Theatre Technology (USITT) recognizes the best contemporary new or renovated theatres. A juried process is used to determine the winners, who receive either Honor Awards or Merit Awards. Past award winners have come from England, Germany, Japan, California, New York, and all points between. Opsis is proud to announce that Reed College’s Performing Arts Building is the recipient of the 2015 Architecture Merit Award! 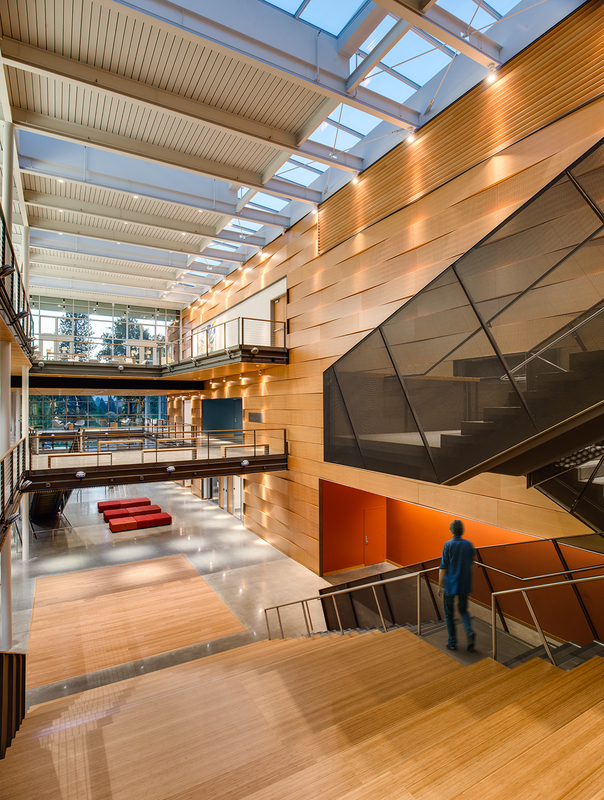 The 78,000 sf Performing Arts Building serves as a front door to the Reed College campus and consolidates theatre, dance and music programs—previously scattered across campus—into a new vibrant and cross-disciplinary home for the arts. It creates intellectual, social and creative communities that cut across disciplines to encourage teamwork and experimentation while meeting the technical needs of each program. The facility is organized around a central atrium lobby and informal learning space that provides an address for each program and four performance venues. The building features a 200- seat studio theatre with flexible seating configurations, a highly experimental 100-seat black box theatre, a 100-seat choral rehearsal hall, and the 100-seat Performance Lab for theatre. Instruction and rehearsal spaces include a multi-media lab and resource library, two large dance and theatre rehearsal spaces, a costume / design studio, shared classrooms and faculty offices. We are honored that our project is among such good company. Other winners are the National Theatre of Bahrain in Paris, France as well as Milton Court—the new performing arts building at the Guildhall School of Music in London, UK. The USITT’s Architecture Commission will present the awards at its 2015 National Conference & Stage Expo March 18-21 in Cincinnati, Ohio, which draws some 5,000 people from the world of theatrical design and technology. We look forward to seeing you there! For more pictures and information about this project, visit here.